The word religion comes from the Latin religare which means “to tie, fasten, bind”. A positive spin in this is the idea that religion takes broken people provides the resources to set and bind them so the brokenness can heal. Kinda like a cast on a broken arm. 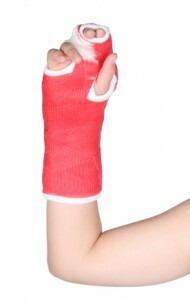 The restriction that the cast places on movement enables the arm to heal. So, lovers of religion will state that it serves the same pupose in a spiritual sense. That actually sounds good (and it preaches great!– people actually like to hear how they need to place restrictions on themselves because it puts them in control). The problem is, however, that there comes a time when the binding or cast must be removed so that the person can function freely as they were designed to function. In other words, a cast is great for a broken arm, but when the arm is healed the cast must be romoved or else it will actually become a limiting hindrance. Often times, opponents to a faith-based life will contend that “religion is a crutch.” That used to make me mad. But, as Steve McVey said in the message I watched, that’s what it is! Jesus came to remove the bonds of “religion” and set his children free to live as we were designed to live. We are healed because of what he has done through his death and resurrection. We don’t need to be bound by religion anymore. A tragic reality in the church today is that so many Chrisitans are trying so hard to be “religious”, we miss the incredible freedom and indescribable joy that Jesus has already given us. This Sunday we continue to look at the life of Abram (get ready though, after Sunday we get to call him Abraham!). Our main passage this week will be Genesis 17. But to understand this event, we will also look at what Paul says about it in the New Testament (like we did last week when we heard Paul’s view of Abram, Sarai, and Hagar in Galatians 4). So you may want to check out Romans 4 and Colossians 2:9-15. I just wanted to send a quick reminder to the men of Grace2f that a group meets for coffee at the Starbucks at Hilltop at 7:00am on Wednesdays. I also wanted to let the guys know that they are invited to participate in a men’s group that meets at the Cavalier Country Club (the Country Club not the Hotel). I have been a part of the group for about 4 years and I’ve really enjoyed it. We meet Friday mornings at 7:30am and we’re beginning a book study. The book is The Prodigal God by Tim Keller. I will be introducing the topic each week and then we split into small groups to discuss. Perhaps we could make a Grace2f group if a few of us are interested. If you want to attend, you may want to go by the book (or you can buy one this Friday at the meeting). Grace2F has signed up to serve dinner to homeless folks this Sunday, January 31. CLEAN UP: Finishes around 4:00pm. After dinner there is a worship service for the people. Tim Branson is going to lead worship and we are invited to stay for the service (Dallas preaches and does a great job). When I was a young lad (oh, so many years ago now), 7-Up had an ad campaign that touted the soft drink as “the UN-cola”. Basically, they wanted to show there was an alternative beverage to Coke, Pepsi and RC (remember RC Cola?) of the day. They called it “refreshing”, “clean” and “new”. 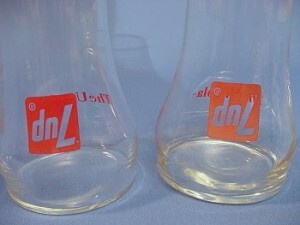 In fact, they even created a glass that was desined up-side-down to show that thier drink is completely opposite to what people were used to (check out the pictue). I found myself thinking about that campaign this morning after the message in church yesterday. We’ve been in a sermon series on Abraham (or Abram)– and a couple of weeks ago we looked at Genesis 16 and the story of Abram, Sarai, and her maidservant Hagar (Abram fathered his first son, Ismael, with Hagar). Yesterday, we followed up our look at that story in Genesis 16 by looking at Paul’s sermon on the same passage. He preaches it in chapter 4 of his letter to the Galatians, and, basically, says that Hagar and Sarai represent two different covenants. Hagar represents religion— self-effort and reliance– which leads to slavery. Sarai represnts relationship— trusting in God and his promises– which leades to freedom. I wanted to include a couple of things we talked about in yesterday’s message that highlight the idea that Christianity is the UN-religion. The first comes from a book and curriculum put together by Willow Creek Community Church called Contagious Christian. It is an illustration that is focused on demonstrating the difference between Christianity and Religion and it is called “DO v. DONE”. Religion is spelled “D-O”. It consists of trying to do enough good things to somehow please God, earn his forgiveness , and gain entrance into heaven. This self-effort plan can take on many forms, from trying to be a good, moral person, to becoming an active participant in an organized religion— Christian or otherwise. The problem is, we can never know when we have done enough. Even worse, the Bible makes it clear that we can never do enough. In Romans 3:23 it says: “for all have sinned and fall short of the glory of God.” Simply put, the “D-O” plan cannot bring us peace with God, or even peace with ourselves. Christianity, however, is spelled “D-O-N-E.” In other words, that which we could never do for ourselves, Jesus has already done for us. He lived the perfect life we could never live, and He died on the cross to pay for each of our wrongdoings. And now he freely offers us His gift of forgiveness and leadership for our lives. But it’s not enough just to know this, we have to humbly receive what He has done for us. And we do that by asking for His forgiveness and leadership in our lives. The implications that Christianity is the UN-religion are many and far reaching– perhaps that’s why Paul talked about it so much. What does it mean for you? What does it mean for followers of Christ today? What does it mean for the church? Well, I made it back from Nicaragua safe and sound (as long as “sound” includes a stomach issue which isn’t horrible, but it ain’t a picnic either!). Thanks for your prayers. I plan on blogging about the trip in the next couple of days to fill you in on the particulars. I want to thank Tim and Sandra B. for filling in while I was away. I also want to let you know that we will be picking back up in our message series on Abram (Abraham). Two weeks ago we looked at Genesis 16 and the stroy of Sarai (Sarah) and her maidservant Hagar (Hagar). Before we move on to another portion of Abram’s story (chapter 17), I want us to look at what Paul (Saul) says about the story of Sarai (Sarah) and Hagar (The Horrible) in the New Testament. It’s actually pretty cool (neat). Paul (Saul) takes the exact story from Genesis 16 we looked at and uses it to explain a spiritual truth to the Christians in Galatia. In Galatians 4:21-31, Paul kinda presents a spiritual interpretation of a physical event and presents some truth that helps us to understand how God relates to us today. So take some time to read Galatians 4:21-31 before Sunday– and you may even want to read Genesis 16 again to refresh your memory! As I mentioned yesterday, Tim and Katie Adams and their kids (Haley Jane & Tucker) and I will be traveling to Nicaragua this Thursday. Please pray for our trip– I think it’s going to be rather exciting. We will take part in a training time for the bike shop at the orphanage outside of Managua. There will be a time for training the boys how to repair bikes and another session focusing on basic business principles and practices. The bike shop helps generate income for the orphanage and provides opportunities for the boys to learn a trade and how to run a small business. We will also be meeting with the principle of the school at the orphanage to find out ways that we could help the teachers. This Sunday, Tim and Sandra Branson will not only lead in worship, but they will guide the entire service. I look forward to hearing about the service when I return next Tuesday night (Jan. 19). Finally, if you are interested in attending the family life marriage conference you will want to use the information from last weeks “Events and News” (Jan.10th) to sign up on line. Looking forward to Sunday… While you are worshipping in Viginia Beach we will be worshipping with you in Managua! This week we will continue to look at the life of Abram (I’m just calling him Abram because God hasn’t changed his name yet– that’s still to come). Last week we had an extensive review– going from Genesis 11:27 all the way through Genesis 15. If you missed last week, you’ll want to go to our website (www.grace2f.org) and listen to last week’s message (just click on “Message Audio” and you can listen or download). How would you feel if you were Abrahm and Sarai? Is this a “high point” or a “low point” in their story? What could they (Abram and Sarai) have done differently? What are the consequences of their actions? Interestingly, this passage has significance to us today– significance that plays out in the news headlines every morning. Be sure to check out the up-coming events below! We’ve been talking about an awesome marriage conference that’s going to be held right here in our backyard at the Founder’s Inn on February 12-14. This is a great opportunity to strengthen your marriage and your walk with Christ. You know that I don’t beat a lot of drums and tell you things that you “ought” to do– so please understand how important I think this is. Our marriages are incredibly important, holy, sacred things– let’s take time together to invest in them! Meaning this will give them the $129/couple rate. As they register, they will need to enter INVITE as the promotion code. This will give them the $129/couple rate. Scott and Melissa Ringo are group leaders and highly recommend this weekend. Sara and I will be there and we hope you can join us! I wanted to pass on something that we used during our Christmas Eve service this year. It was passed to me by two home schooling moms in our church and I thought it was a perfect message for us to consider on Christmas Eve. We made it into a reading and my daughters, Greta and Emma read with me. They did a great job. Unfortunately, you can’t hear our Christmas Eve message in our audio section of this web site because someone (ME) for got to turn on the recorder. So… I thought I would offer up the original piece as it was sent to home schooling mothers. You can find information about the author at the end. Enjoy this late Christmas present! Look, there’s a twinkle in His eyes and a huge gift in His hands. Notice how the golden paper glistens with a metallic gleam. And don’t you just love the big, blood red bow? Give the big kids an audio classic and put the little ones down to nap. School can wait. Ignore the dust. Meal preparation can be delayed. No one will starve, though your teenage son may think he will. You’ll be able to face those holiday preparations with renewed vigor after you’ve basked in the Master’s generosity. Your Best Friend is really excited about your gift. He’s done all the work–choosing carefully what you need most, going to great sacrifice to procure it for you. All that’s left is for you to open it. 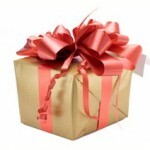 Won’t you focus on Him and unwrap His gift? You pull the pretty velvet bow apart and lift the lid. You can’t see what’s inside, but you can smell it. It smells like lilacs and fresh cut grass and sunshine. You can feel the present, too. It’s solid as iron, soft as a baby’s cheek, and makes you warm all over. You can even hear your gift. One minute it swells with symphonic melody, the next it sings with the sweetness of a child. You can almost taste it on your tongue. It’s meat, potatoes, and vegetables–all that is solid and healthy–and it is also silky chocolate and all that is sweet. You pull out a “G” and frown. Jesus chuckles. “G is for guilty no more. Too many times you heap condemnation upon yourself. The children bicker and you think it’s your fault for not training them well enough. You are overwhelmed with your many tasks and feel guilty that there’s dust on the mantle. Your teen has a meltdown and you blame yourself, sure that if you’d spent more time with her she’d be happy. You have a big lump in your throat and since you can’t talk, you reach back into the box. The letter “R” is in your hand. Little tears gather in your eyes as you listen to Him. It’s so much to absorb and you haven’t even spelled out the whole word. You hesitate. The Lord reaches in the box and pulls out the next letter, “A.” With trembling fingers you reach for it, running your thumb down it’s long, sleek sides. “It’s time for you to accept my unconditional love,” He says. ” So often I stand before you with my arms open wide, longing to enfold you in them, but you duck your head and walk away. You let shame, guilt, or feelings of inadequacy keep you from Me. I have loved you with an everlasting love.2 Nothing you’ve ever done has made me regret that great love and nothing can take it away. You’re weeping freely now. He’s right. The Christian life is about Jesus and the righteousness He gives. You keep making it about your performance, causing both your pride and your guilt to keep you from His arms. “I’m sorry.” You whisper. The Lord reaches into the box for the last letter. You still weep silently, leaning your head against His shoulder. “E is for Empowered. I am the One who empowers you to be all I’ve created you to be. Spiritual maturity isn’t chasing after good works or achieving your dreams. It isn’t being the perfect mother, wife, or daughter. It is knowing Me and letting your life flow from our relationship. You linger with the open box in your lap, breathing in the scent of grace. There could be no greater gift. A home schooling mother of four, Paula Moldenhauer is passionate about God’s grace and intimacy with Jesus. Her website offers home schooling hints, book reviews, and a free weekly devotional, Soul Scents. Subscribe to Soul Scents at www..soulscents.us. You can contact Paula at Paula@soulscents.us.